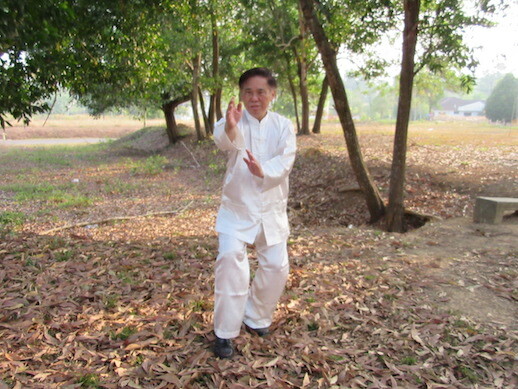 Grandmaster Wong performing a Taijiquan pattern called "Lift Hands"
Tai Chi Chuan, or Taijiquan in Romanised Chinese, is a wonderful art, but more than 90 percent of those who practise it gain less than 10 percent of its potential benefits! This book will not only justify this claim, but will also provide the information you need to gain the remaining 90 percent of the benefits. Although it is written from personal experience, much of the information given is derived from the writings of the greatest masters of the art, mainly in classical Chinese, which have been cherished by Tai Chi Chuan practitioners throughout the ages. For those who are unfamiliar with Tai Chi Chuan, it is a time-tested art which gently exercises the body, the energy flow and the mind, and can be used for health, longevity, self-defence, mental freshness and spiritual development, irrespective of your race, culture or religion. It has been described both as poetry in motion and, erroneously, as shadow boxing and slow calisthenics. “Poetry in motion” is an apt description of the beauty and grace of Tai Chi Chuan, but the terms “shadow boxing” and “slow calisthenics” reveal lack of understanding of its depth and dimension. This book, as its title suggests, gives a complete explanation of Tai Chi Chuan, from the most basic to the most advanced levels. It has something for everybody interested in the art, or in their own or others’ well-being. This is what Tai Chi Chuan aims at, including the attainment of grace and balance, the promotion of physical and emotional health and the development of internal force or energy flow – for which Tai Chi Chuan is well known but little understood. It shows how to apply Tai Chi Chuan for combat, especially how to use an opponent’s strength against him – or herself, and compares the various styles which have evolved to meet different needs. It will also help you understand how the early masters employed Tai Chi Chuan for spiritual cultivation. Yet, despite its extensive and often deep coverage, no prior knowledge of Tai Chi Chuan is required. If you want to enjoy its wonderful benefits, however, you must practise it correctly and consistently; no amount of reading can make you a competent Tai Chi Chuan practitioner. This book provides invaluable information, culled from the accumulated wisdom of the greatest Tai Chi Chuan masters, but unless you put it into practice it will remain simply theoretical knowledge, giving you perhaps some reading pleasure. You may be able to discuss Tai Chi Chuan intelligently with your friends, and even offer good advice to some practitioners, but you yourself are unlikely to acquire the type of radiant health, graceful agility and mental clarity that such advice is intended to accomplish. Apart from some advanced training, such as that involving energy and mind control which requires a master’s personal guidance, the book is written as a self-teaching manual. But as many fine movements cannot be easily learnt from a book, however clear its presentation, it is advisable for beginners to seek personal instruction from a competent teacher. It is a common mistake for students to rush their learning; if there is one golden rule on which all masters would agree, it is to practise the correct methods patiently. All the established methods have passed the test of time; if a particular method is said by many masters to produce certain effects, it means that thousands of people who followed that methods have experienced the effects. If you fail to do so, it is usually because you have not practised sufficiently or correctly. Nevertheless, practising patiently does not mean following a method blindly. If a student who has practised Tai Chi Chuan for many years still remains sickly, weak, emotionally unstable or mentally dull, then he or she has not been judicious or wise. Such a person should either turn to something else, or seek more information from masters or books to improve his or her practice. Generally, people who have correctly practised an established method for a year should reap the benefits that method is reputed to bring. This book offers many of the established methods taught by some of the greatest Tai Chi Chuan masters in history. Besides explaining in detail the fundamental techniques common to all styles, and the Simplified Tai Chi Chuan Set which helped literally millions of the Chinese population to remain healthy and sane despite the traumatic effects of numerous wars and three revolutions in recent times, it presents all the various styles of Tai Chi Chuan in the way in which their best-known masters taught and demonstrated them. Since Tai Chi Chuan is a very effective martial art, combat applications are treated in detail, and martial artists can discover the Tai Chi Chuan tactics for remaining unhurt even if one loses a fight – in many other martial system getting hurt is inevitable even for the victor. There are also numerous exercises to put principles like “soft overcoming hard” and “flowing the opponent’s momentum into practice”. Virtually all the great masters have stressed that the significance of Tai Chi Chuan lies in its internal aspects and not its external form; most Tai Chi students know that this is an internal art but few understand what this really means and fewer still can experience its internal aspects. This book aims to help students overcome this problem: by explaining the relevant principles as well as providing suitable exercises, it shows you how to realise the Tai Chi Chuan tenet that every movement of this internal art is a training of energy and mind. Although Tai Chi Chuan has a rich philosophy, usually recorded in poetic language, and some examples are found in this book, it is geared towards practical use in combat and, more significantly, in our daily life. In other words, if you have practised Tai Chi Chuan for 20 years, but cannot yet defend yourself when an assailant attacks you, or are still prone to anger or nervousness, or lack the energy to run and jump irrespective of how old you are, you have wasted your time. This book explains why and how Tai Chi Chuan enhances your health, work and play. Many people, especially in the West, are surprised to discover that Tai Chi Chuan is a martial art; they are even more surprised to learn that it was originally devised for spiritual cultivation, irrespective of one’s religious conviction or lack of it. This book traces Taoist connection, and shows how an aspirant can practise Tai Chi Chuan for spiritual development. My original idea for the title of this book was The Wonders of Taijiquan, for it was the desire to share the wonderful benefits of this art that prompted me to write this book. But my capable editor, having the readers’ interest in mind, suggested The Complete Book of Tai Chi Chuan, which I must admit is better. I would like to comment briefly on the word “complete”. The book is complete in the sense that it presents every aspect of Tai Chi Chuan a student might wish to know about, including little-known but interesting snippets such as why the stances in one Wu Style are higher than those of another, or how the flowing movements in all Tai Chi Chuan styles are linked to Lao Tzu’s teaching in the Tao Te Ching. Even the question of knee injury, which appears to be a contemporary serious problem among many Tai Chi practitioners in America, is discussed. But it does not mean that all the important information about Tai Chi Chuan is found here in its entirety. There is so much wisdom in Tai Chi Chuan that volumes could be written on the material contained in each chapter. For me personally, the writing of this book is both unexpected accomplishment and a rewarding learning process. I never thought of writing a book on Tai Chi Chuan, and for a long time I even resisted teaching Tai Chi Chuan despite many requests and despite knowing that it has many wonderful benefits. The reason was that I thought I would do better to stick to teaching aspiring students Shaolin Kungfu, as that was the best system I could offer them. Although I have learnt Tai Chi Chuan for more than 20 years, my training is mainly in the Shaolin arts. I have been privileged to learn from distinguished Shaolin masters with a succession line extending directly back to the famous Shaolin Monastery, and I cherish the belief that a good teacher should always give his best to his students. However, years ago when I was teaching Shaolin Chi Kung to students who were also Tai Chi Chuan teachers, and therefore incidentally imparted some Tai Chi Chuan principles and methods to them, I came to realise that my reason for teaching only Shaolin Kungfu – the fact that it was what I am best at – was only valid from my own perspective. From the students’ perspective, Tai Chi Chuan would be more beneficial, because, apart from the fact that their circumstances were more conducive to Tai Chi Chuan practice, not many people actually have the endurance and discipline needed for Shaolin Kungfu training. And when I notice that 90 percent of those practising Tai Chi Chuan were gaining less than 10 percent of its potential benefits, mainly because they lacked the kind of knowledge that was once regarded as top secret in the martial arts field, the desire to write a book and share this knowledge took shape.